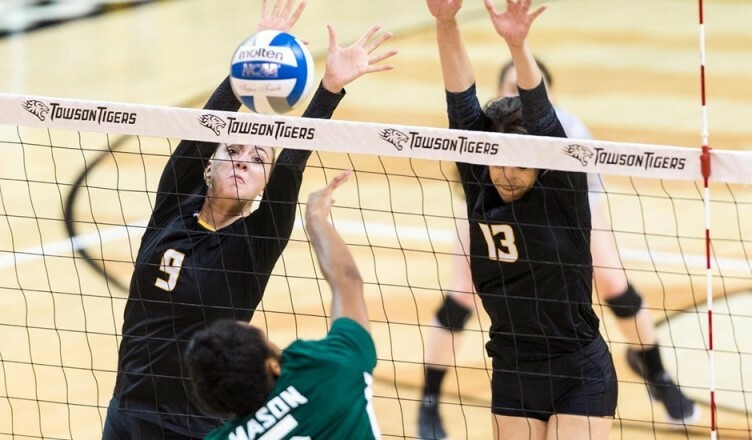 Towson closed out its regular season with a 3-0 (25-20, 25-23, 25-17) win over Colonial Athletic Association (CAA) foe Delaware at SECU Arena Sunday afternoon. Before the match, the team’s two seniors, Julymar Otero and Payton Windell, were honored on senior day. Otero, who was two digs shy of another triple-double, led the way for the Tigers with 14 kills, 15 assists and eight digs. Junior Carola Biver had a double-double with 10 kills and 16 digs. Redshirt junior Anna Holehouse moved into second place on Towson’s all-time career digs list with 1,622 career digs, passing Stacy Humphries who had 1,617. A highlight of the match was the return of Windell, who the Tigers lost for the season due to injury. She hit the match’s first serve, and later re-entered to deliver a service ace to secure the win. Monday, Towson hosted James Madison in its third match in four days. The team outlasted JMU to win the match 3-2 (25-23, 25-27, 25-22, 24-26, 15-10). Otero put in another strong performance as she recorded her CAA-leading sixth triple-double of the season with 15 kills, 27 assists and 14 digs. She still ranks second in the country in triple-doubles. The Tigers (26-4) finished CAA play with 12 wins and four losses to lock up the No. 2 seed in the CAA championship tournament for their second time in three years. The tournament runs Nov. 16-18, and will be held at James Madison in Harrisonburg, Virginia. Towson, who has a first round bye, will face the winner of No. 3 seeded James Madison and No. 6 seeded Elon.